Our hotel — booked, as usual, through Airbnb — had the best view I’ve ever seen from a hotel room. A list of nearby tourist activities included kayaking, a chocolate tour, rappeling down waterfalls… there was a full page of options. 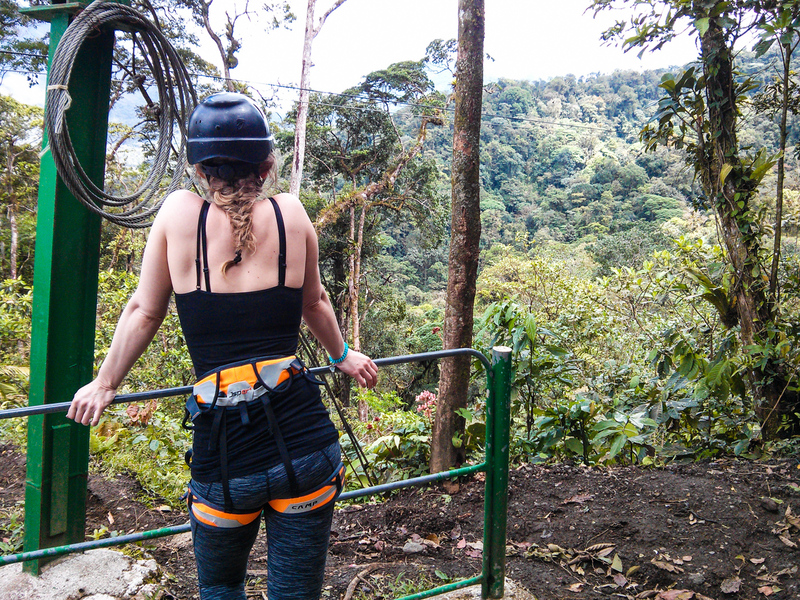 With one day allotted for adventure activities, we chose a ziplining tour. (Neither of us had ever been!) Watch the video here! 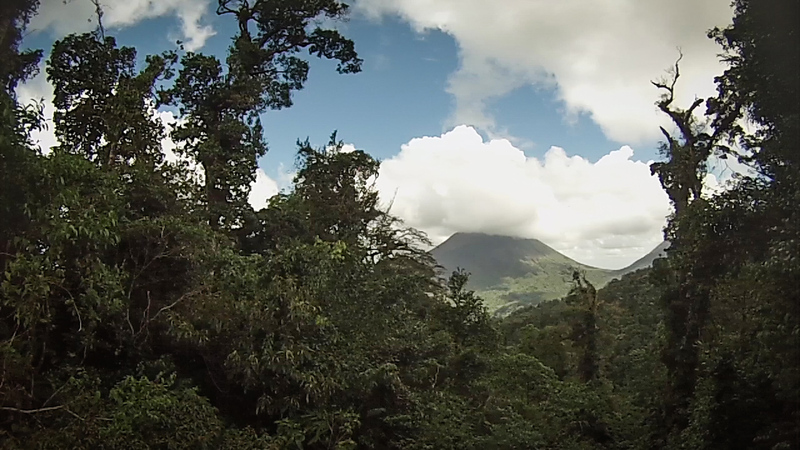 Video: North to South (Diana Southern and Ian Norman) go hiking over hanging bridges, ride a gondola through the rainforest, and try ziplining for the first time with Sky Adventures near Arenal Volcano National Park, Costa Rica. As you can tell from our video, we had a fantastic time. Below are details from each part of our Sky Adventures experience. We started our tour with Sky Walk at 7am. It literally started raining right at the beginning of our tour, which continued for about 45 minutes. We made the best of it, though, and it was A-OK. I’m SO glad we brought our rain gear, though, which I’d grabbed at the last second as we were rushing out of the hotel. We’d have been pretty wet and miserable without it. The Sky Walk tour lasted for about 3 hours and included 5 hanging bridges which were all well-constructed and safe, though they do sway and bounce you around a bit with several people walking on them at once. 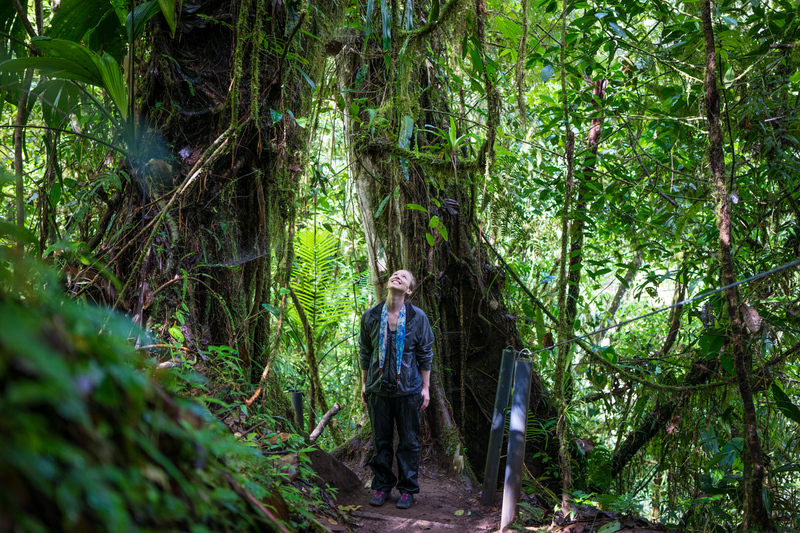 The rest of the walk is hiking through the rainforest. 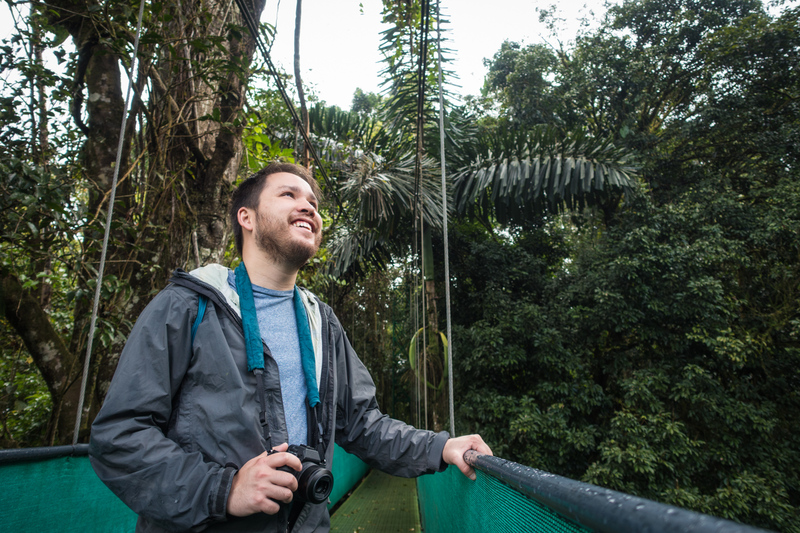 In contrast to the “mostly flat” walk Sky Adventures offers at Monteverde, the Sky Walk at Arenal has common ups and downs and was a bit muddy at parts due to the recent rain. 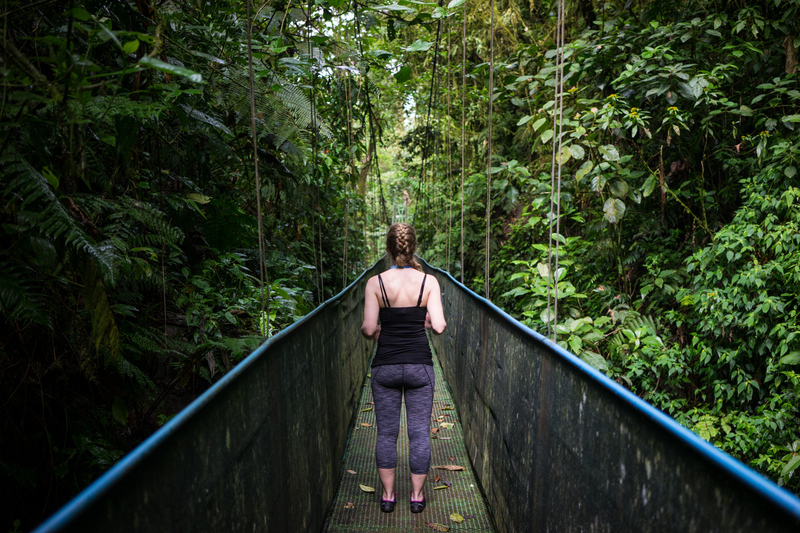 Thus, the Arenal Sky Walk is best for the physically fit. 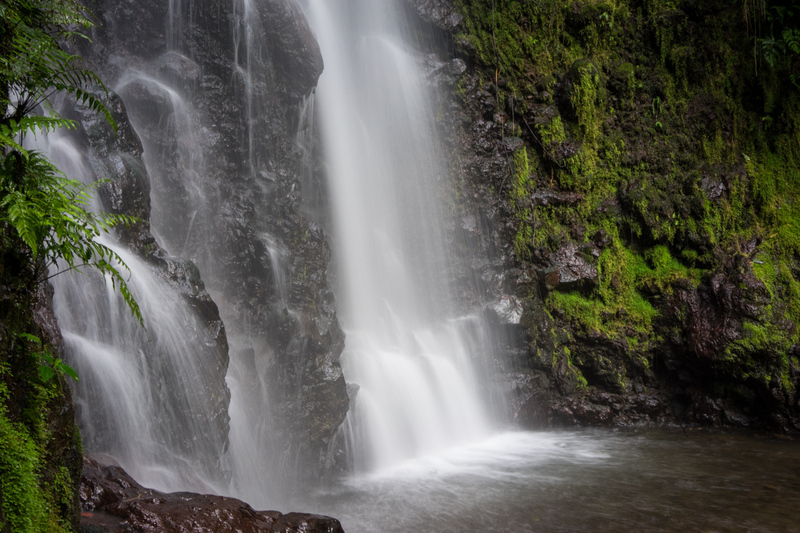 There is an option to turn around at a certain point in the tour if you want to stick to the easier part of the hike, but you’ll miss the waterfalls if you do. The highlight of the walk for me was stopping at the base of two waterfalls! The bridges were cool, too. Our tour guide, Minor, had a good sense of humor and pointed out notable plants and animals along the way. We heard howler monkeys when the wind blew and even spotted one way up in the trees. Look for footage from our Sky Walk experience at the beginning of the video at the top (0:04-0:54). Note: As an individual tour, the adult price for Sky Walk was $35. Perhaps I was too caught up in the excitement of ziplining to care much about the gondola ride, but this part wasn’t that exciting for me. I was also somewhat distracted tinkering with the GoPro we’d rented. On its own, I do think Sky Tram would be an enjoyable experience for anyone not wanting to engage in too much physical activity but still see a nice high-up view of Arenal Volcano. The ride took about 10 minutes to get to the top and again felt completely safe. 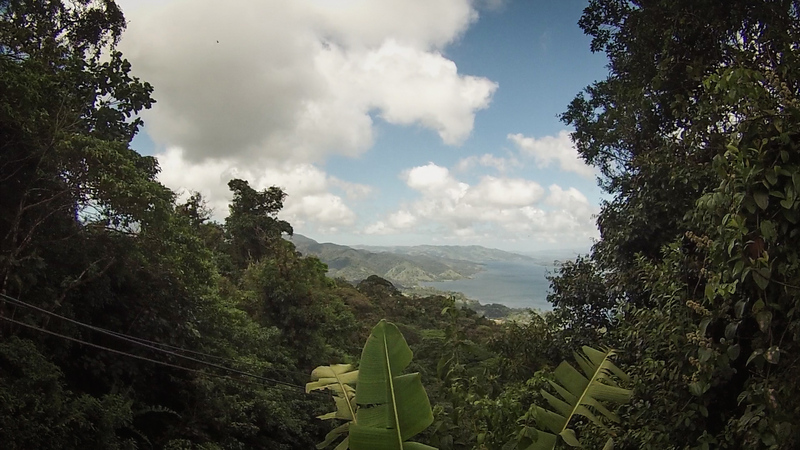 The views from the deck at the top were pretty awesome, but not as good as we’d see while ziplining. 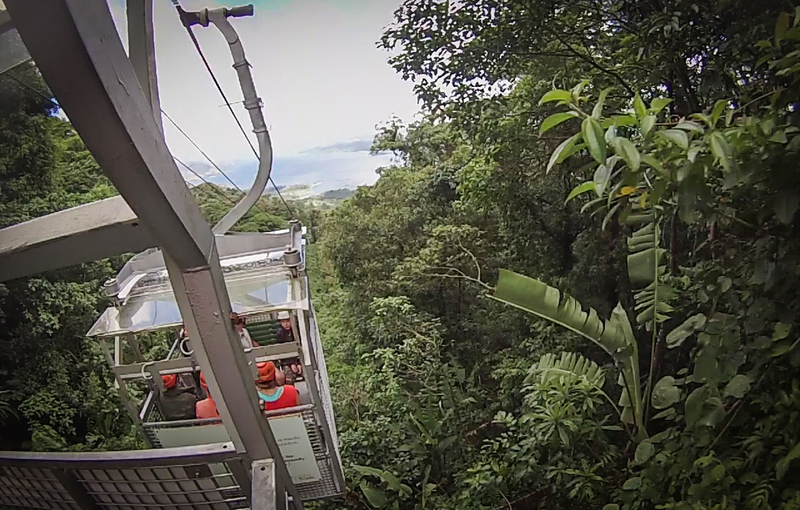 Look for footage from our Sky Tram experience in the video at the top (0:55-0:57 & 1:02-1:09). Note: As an individual tour, the adult price for Sky Tram was $44. Hands down, this was the best part of our combo tour. I’m generally afraid of heights, and somehow the ziplining wasn’t scary for me at all. My first run was absolutely breathtaking; I remember thinking I was too excited and amazed to be scared. 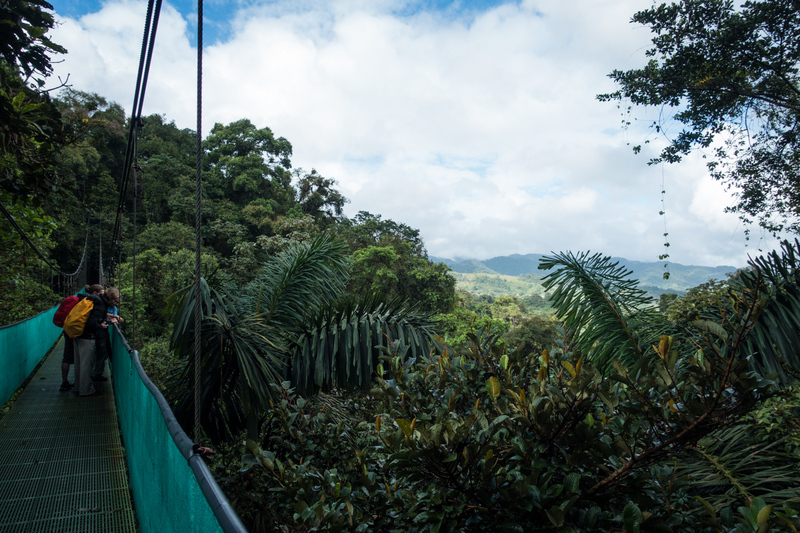 Since you can’t very well start ziplining without getting up to the first platform, the Sky Trek experience includes the Sky Tram gondola ride, but just on the way up. You’ll zipline your way back to the parking lot. After stowing our stuff (cameras, backpack, my purse, etc.) in a free locker, we were quickly geared up and ready to go. Sky Adventures staff fitted us with a harness and trolley, helmet and gloves. 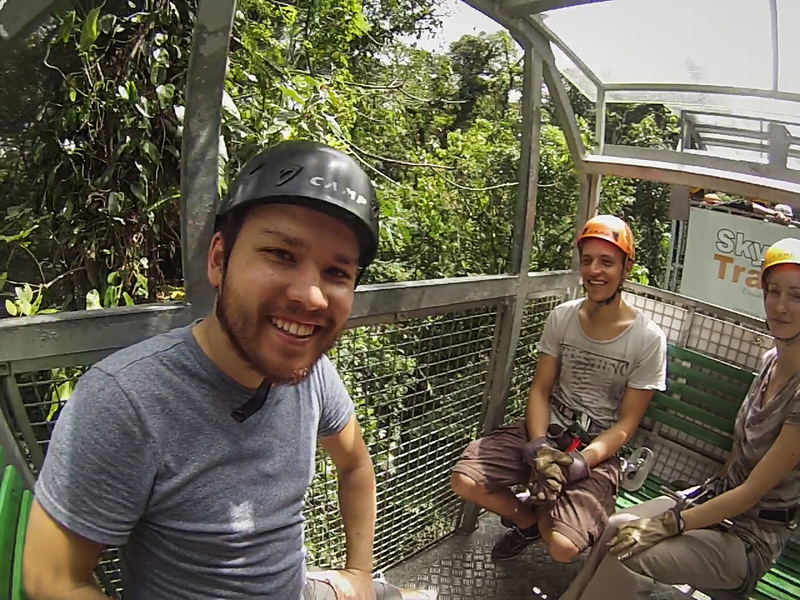 Since we wanted to rent a GoPro to document our first zipline experience for this blog post here, we next swapped out my helmet for one with a helmet harness and GoPro. Then we headed out for a 5-minute lesson on proper zipline form and how to brake when nearing the end. We took the 10-minute Sky Tram ride up and then got ready for our first zipline (the “training” zipline). With about 15-20 people in our group, it took about 20 minutes to get everyone to the next platform. Another group of about 15-20 followed us. As we got going, the wait time decreased at subsequent platforms. The wait wasn’t boring, though. We had fun watching others in our group coming in from the last one and getting started on the next one. Look for footage from our Sky Trek experience in the video at the top (0:55-end). Note: As an individual tour, the adult price for Sky Trek was $71. Ian wore a t-shirt and lightweight cargo shorts with zippered pockets on the sides, so he took his cell phone, which came in handy for a few quick photos on the platform. I wore a tank top and leggings and had only sunglasses with me, which worked nicely protecting my eyes from the wind. I somewhat regretted not bringing my light jacket; it got a little chilly up on the platforms whenever the clouds rolled in and wind blew. Note: I would NOT recommend taking anything loose unless you can secure it completely and comfortably in a zippered pocket. I would HIGHLY recommend having someone in your group wear shorts/pants/jacket with a zippered pocket, though. While a big bulky camera isn’t allowed, a pocket-sized cell phone will save you money on photos. So. Many. Bug bites. We should have brought bug spray. 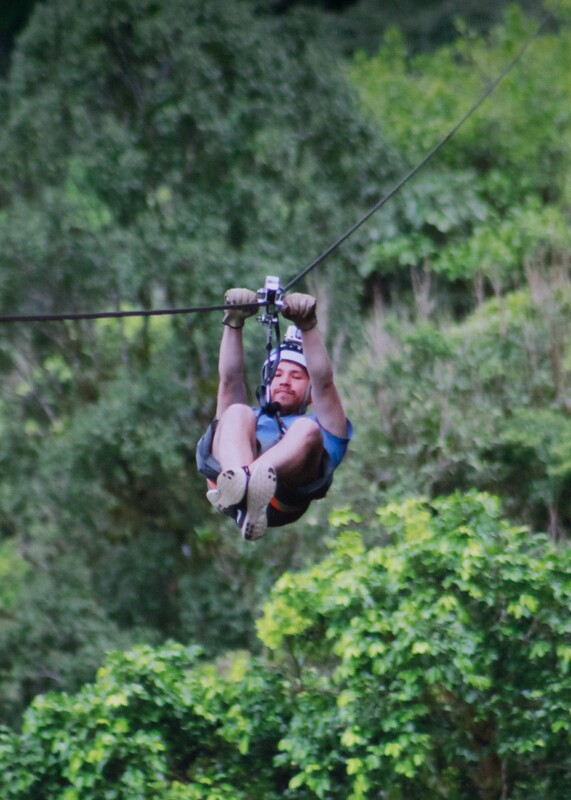 Ziplining is kinda painful (but not nearly enough to skip it)! 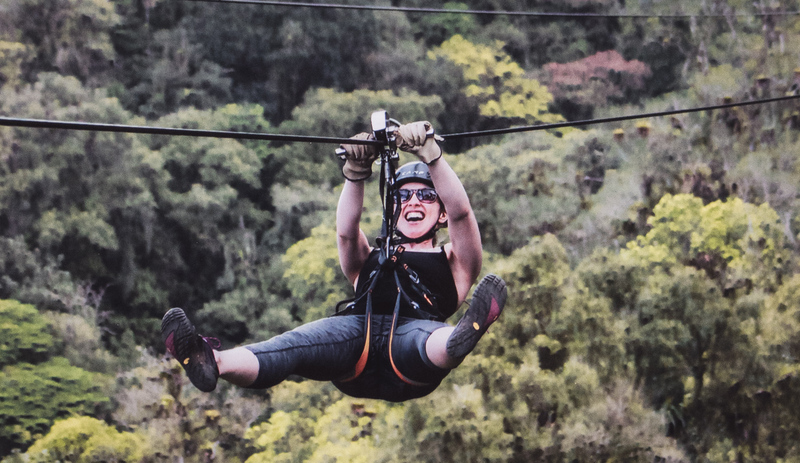 Note: It’s more affordable if you combine the three tours at $93 (without lunch), but if you need to save money or time or don’t want to do either the ziplining or the hanging bridges, you can book Sky Walk ($35), Sky Tram ($44) and Sky Trek ($71) individually. *There was confusion over the whole photo purchasing process — a breakdown in communication between the staff and participants — which would really be my only complaint about the whole thing. Here’s what happened: At the end of our fifth zipline, a photographer snapped photos of us as we came in, and then another gentleman showed them to us on a computer monitor, asking which ones we liked. He never mentioned the price, nor that we were expected to buy them if we pointed out the ones we liked; he only told us that we could pick them up at the end of our tour. I assumed the photos would cost something, but I NEVER got the impression that I was entering into a binding agreement to purchase by pointing out the photos that I liked. When we began looking at our photos after our tour, however, it became apparent that we were expected to purchase them. The girl handed us our photos, and while we were looking through our four photos, I asked her how much they were. $10 each. Yikes. As Ian and I discussed maybe just getting two instead of the four in front of us, she asked “didn’t the man tell you how the photos worked?” to which we replied that he’d only told us they’d be ready at the bottom. “Are you sure?” was her response. I was taken a little aback — it seemed like she didn’t believe us — WTF? Since the last job I worked was in the guest services and tourism industry, I understood her frustration, especially since her co-worker should have made it clear to us how it worked. But I do think she could have handled it better. I wondered if perhaps we’d been the exception — maybe he’d only forgotten to tell us about the “if we print, you buy” deal — but everyone else who approached the photo window after us had the same reaction, asking how much they cost and under no impression they were obligated to buy them. 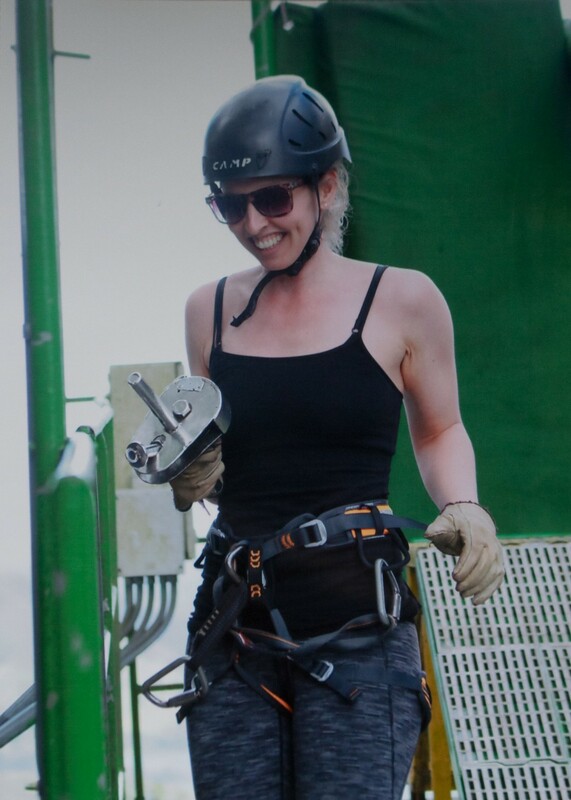 Overall, I give Sky Adventures two thumbs up. Be ready for anything; bring your bug spray, rain gear, and sunscreen, and you’ll be in for a fantastic adventure! Don’t forget your student ID for a student discount at Sky Adventures. The website is also currently advertising a 5% discount if you book through their website with the code adventure5. Ticket and package info here. 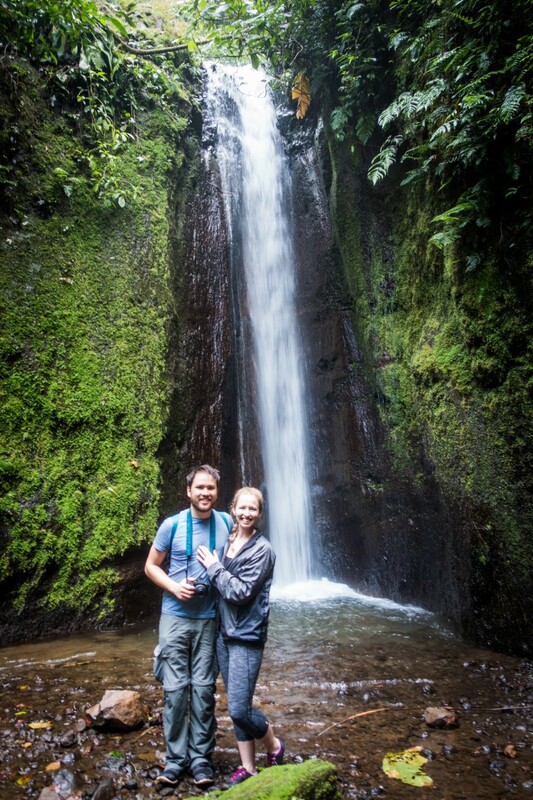 Want to see more fun stuff from our trip to Costa Rica? 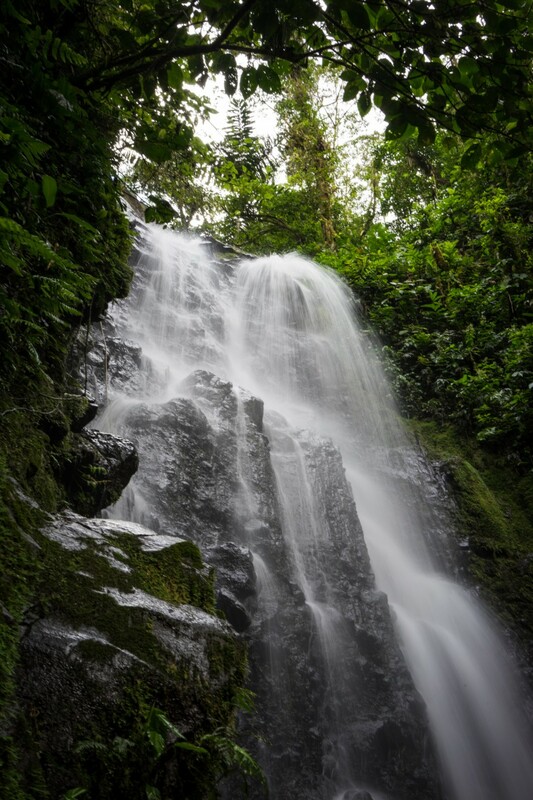 View our other Costa Rica posts here. 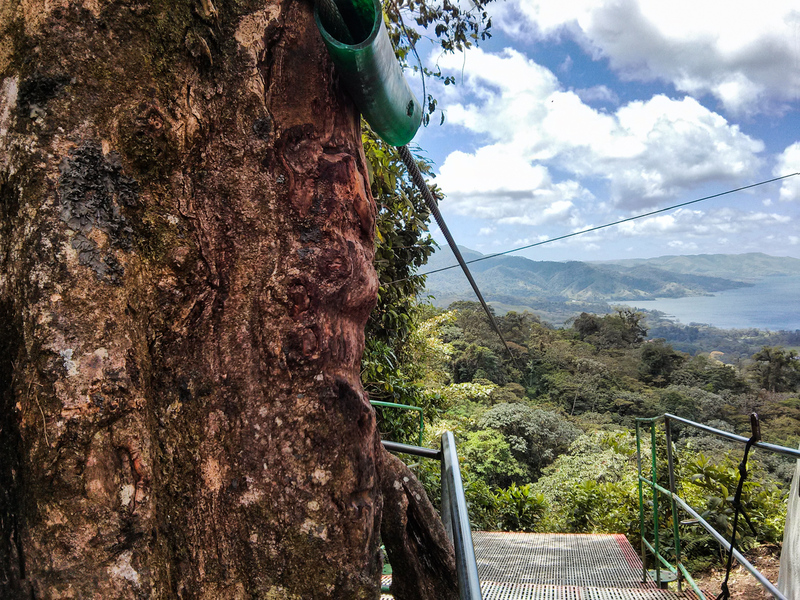 we want to try ziplining and will go to Arenal Sky PArk – the question is whether we should book the combo package which is just slightly more than just the zipline. Can you do just some of the zip stations – in other words, if it proves to much for us is there another way down!! I presume that one can also leave the hanging bridge tour whenever they wish. Do you have to buy lunch or can food be brought into the park? Thanks for any other hints on Arenal or MA. That’s awesome, Barbara! 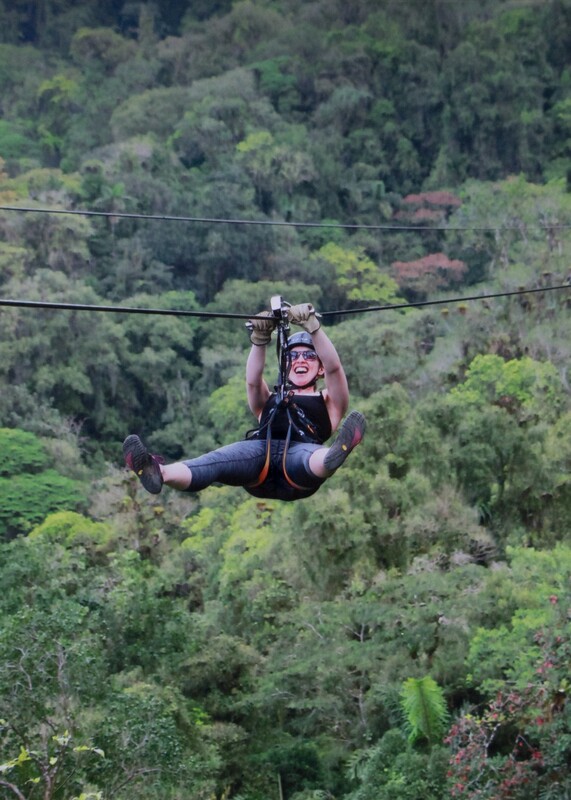 Ziplining is so much fun! I would recommend booking the combo since, like you said, it’s not much more. 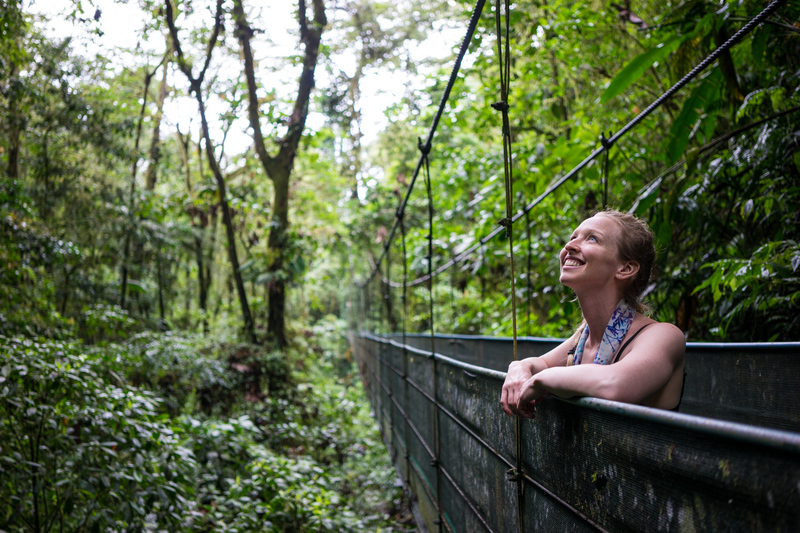 The hanging bridges tour has different sights to offer, being in amongst the trees rather than up above them. On our bridges tour, the guide gave us the opportunity to turn around before ‘the hard part’ part-way through, so you do have that option on that part of the tour. Lastly, you don’t have to buy lunch. We bought ours there just for convenience, but it didn’t seem like anyone would run you off for bringing or eating your own food. Most people I saw did not eat at the restaurant there. I hope you and your family have an awesome time! Let me know if I can answer any other questions. 1) The Sky website says the tram is 1 hour, the bridges is 3, and the zipline is 2.5. However, a lot of sites say the tram is 10 minutes. Wondering if the other activities are inflated as well. About how long was the entire tour? 2) Did you have the option of a guide on the Sky Walk? The website says it is guided, but I did not see one in your video. I’m hoping I can easliy decline a guide if needed. 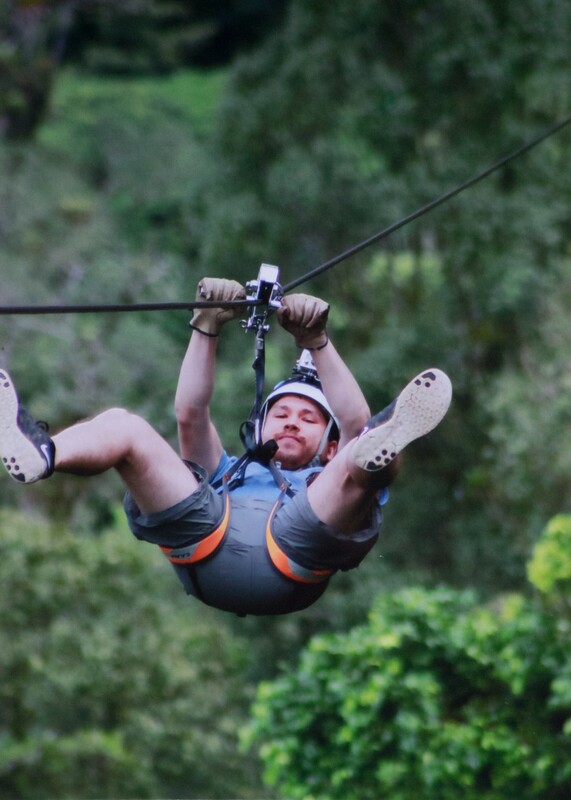 3) Did you know if you can bring your own GoPro on the ziplines? 1. The tram ride itself is definitely not an hour (I think the 10-minute estimate is more accurate), but if you’re budgeting time for the day, I could maybe see how the whole charade from arrival at the tram base/locker area to the time you’re about to start ziplining could end up taking an hour, if it’s a busy day. First you check in and staff fits you with your equipment. Then as you proceed toward the tram, they go over zipline basics and safety, which takes about 5 minutes. From there you may wait a short bit while people in front of you load into the individual tram cars. And then there’s a part where they stop on a large deck/platform with views of the volcano and they give you some time (maybe 10-20 minutes, depending on how long it takes your zipline group to gather together) to take photos and enjoy the views. I think the estimate of how long everything takes is probably pretty accurate. I purposely made my video the full-length of each of the ziplines so that viewers could see how long you’re actually spending ziplining on the tour. And the zipline part really is truly spectacular. 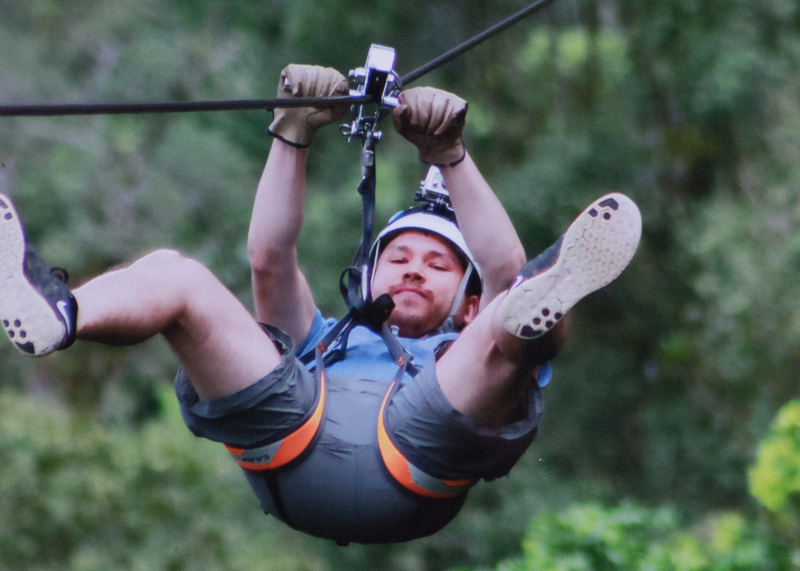 Since this zipline adventure, we’ve done another one, in Puerto Vallarta, and Sky Adventures was hands down more spectacular. The height and views are both amazing. 2. We did a guided tour on the Sky Walk. I believe the property is privately owned (it’s not inside the national park area), and you do sign a waiver before participating in any of the activities, so my guess would be that it is NOT an option to do an unguided walking tour. 3. Unfortunately I think the answer here is no, for the zipline part. (You can bring your own camera for SkyWalk.) I’ve found this with other zipline companies, too, and I know it’s totally frustrating. The way it worked here for us is when we said we wanted to rent the GoPro, they gave us a different helmet that already had the mount attached. I don’t think we paid anything upfront, and at the end we had the opportunity to review our footage to decide whether we wanted to buy it. I believe we paid something like $35 for it, and they gave us the micro SD card with the raw video footage on it. They also backed up the footage to their computer on site, in case we lost it or something went wrong with the card. It was definitely nice to have the option to purchase or not after we saw what we’d be getting. I hope this is helpful in planning your trip! P.S. Watch out for the printed photos. They have a photographer that comes along to snap photos of the group and they’ll show them to you at a break stop in between ziplines. If they print them for you, they expect you to buy them, and they’re not cheap. Nor do they tell you how much they’ll cost when they ask you which photos you like (and if you say you ‘like’ them, they take it as you want them to print them). I’ve found this to be a huge problem in other places, too. Such a bummer, but if you know to expect it, you can easily avoid it!